Special formula gives you more open time for installation, and many re-tack opportunities. The water based bonding agent is part of Dicor’s three-part roofing system that includes the roofing membrane, bonding adhesive and lap sealant. Dicor has secured the best combination of products to make installation of a new roof covering as easy and reliable as possible, thereby enhancing RV enjoyment. Each component in the kit is formulated, tested and proven in the field to create an excellent bond. 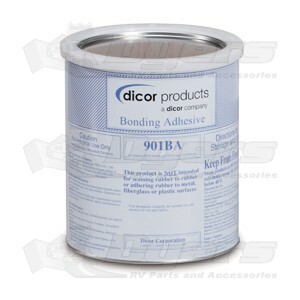 By using this Water Based Bonding Adhesive as part of the installation system -- according to the instructions provided -- for Dicor EDPM and TPO installation, Dicor will warrant that aftermarket product for 12 years. This product is NOT intended for seaming rubber to rubber or adhering rubber to metal, fiberglass or plastic surfaces. Contains no hazardous ingredients per OSHA 1910.1200. This material is to be used on porous substrates only. Stir thoroughly before use and keep covered when not in use. Surface Preparation: Clean, dry surfaces are required for optimum bond strength. Application Methods: Apply adhesive evenly at a rate of one gallon for every 160-180 square feet to thte substance by short nap roller. Open Time: EPDM Rubber and TPO membranes should be immediately rolled onto the adhesive. No waiting time is necessary. Care should be taken to minimize the air trapped between substrates. Bonding: Mate the surfacs with only enough pressur, evenly applied, to insure good contact between the substrates. Excessive pressure can redistribute the adhesive in an uneven manner. Empty containers: When "empty" this package may contain harmful vapor and residue. Do not reuse container or remove labels. Follow label warning even "empty". Disposal should be in accordance with applicable regulations.